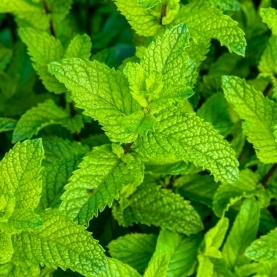 Peppermint is an essential oil that we would not be without. It is definitely an oil that belongs in any basic aromatherapy kit. It is useful when traveling because of the variety of purposes; benefiting the digestion, muscular aches and pains, respiratory issues, etc. Combine the essential oils in a small bottle to create a stock blend. Mix with a tad carrier oil or use neat on the temples and back of the occiput. Do not get near the eyes.